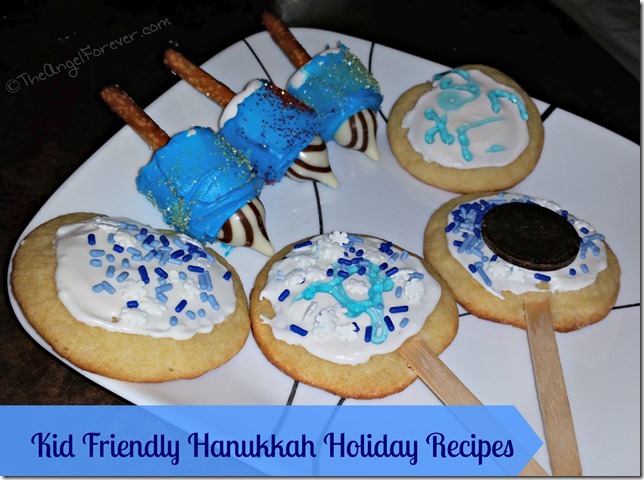 The holiday season usually means that the boys want to share something Hanukkah related with their friends at parties. While I often go into school to read a story and/or play dreidel with the kids, I wanted something new and different this year. The kids and I saw some holiday recipes and baking ideas that we hoped to personalize for The Festival of Lights. To get ready for Hanukkah, the boys and I went to Price Chopper together. We were on a mission to get baking supplies for kid friendly #HolidayAdvantEdge recipes. 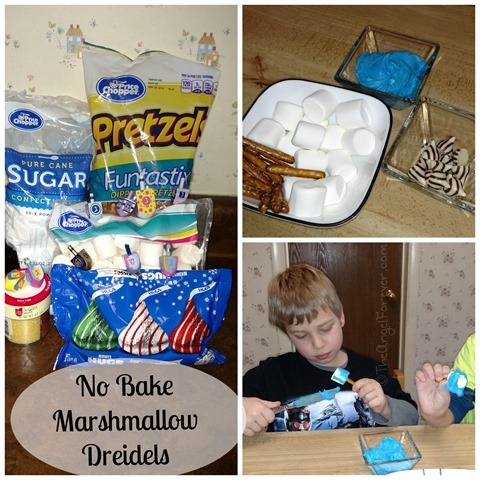 Thanks to #CollectiveBias we were looking for ingredients to make Marshmallow Dreidels and Hanukkah Cookie Pops. When we arrived at Price Chopper, we went right to the baking aisle. The boys immediately found the Betty Crocker cookie mix that would be perfect for our project. We also grabbed some marshmallows, icing, powdered sugar, and gel for decorating. 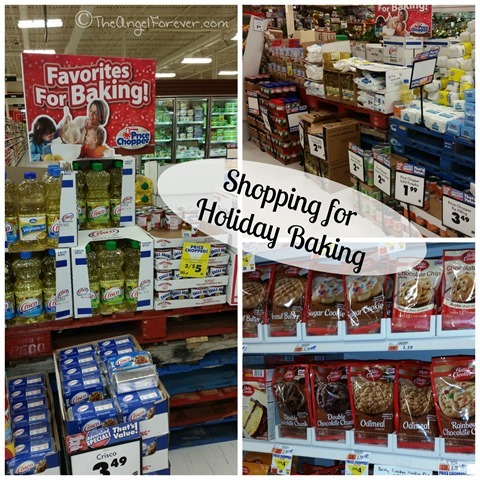 That’s where we saw a sign that let us know to head over to the front of the store where there was a Favorites for Baking section with additional items for the holidays. In this area, we found the Crisco Shortening Sticks (alternative to butter), holiday Hugs and Kisses from Hershey, along with winter sprinkles. The only items we had to go back for were pretzel sticks and Hanukkah gelt. For years, we have seen photos of people that made Marshmallow Dreidels, but we have never made them. We had planned on making our own glaze, but it did not want to work. Thanks to our oven dying the night before Thanksgiving, I was lucky when Nana and Papa had frosting that we were able to use. This ended up being a great substitution because I can see making these as a snack with kids in a classroom. We set up bowls with all of the ingredients so the kids could just grab what they needed. Knives to spread the frosting was the only additional item that was needed. First, we took a marshmallow and put a pretzel stick about 2/3 of the way into it. Once this was secure, it was time to frost the outside of the marshmallow. We selected blue, but any color would work, including regular chocolate or vanilla frosting. Once a thin layer was all the way around the marshmallow, a slightly larger amount was placed onto the bottom. This acted as the glue that held the Hug or Kiss into place. The last step was to put some sprinkles or colored sugar on the outside to make it more colorful. Cake pops are still really popular, but they are more time consuming and not as kid friendly. 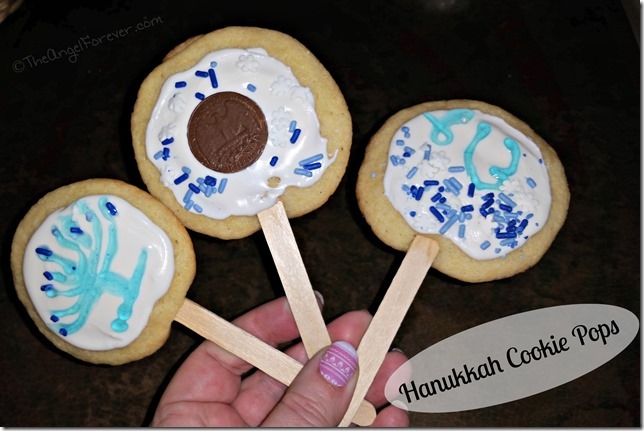 We decided to make cookie pops for Hanukkah that the kids would decorate for themselves. If I was taking these to a party, I would make the cookie pops ahead of time and pack them to bring with supplies for the kids to finish making at the event. We followed instructions on the package of Betty Crocker Sugar Cookie Mix. Since we were using Crisco instead of butter, we read how to substitute that on the side of the Crisco box. For the half cup of butter, we used half of a Crisco stick and a tablespoon of water. This was mixed with the egg really easily to form the dough. JSL then helped me to make tablespoon sized balls of dough while our crafting sticks soaked in water. When it was time to put the sticks into the dough balls, it helps to flatten them ahead of time with a water glass. 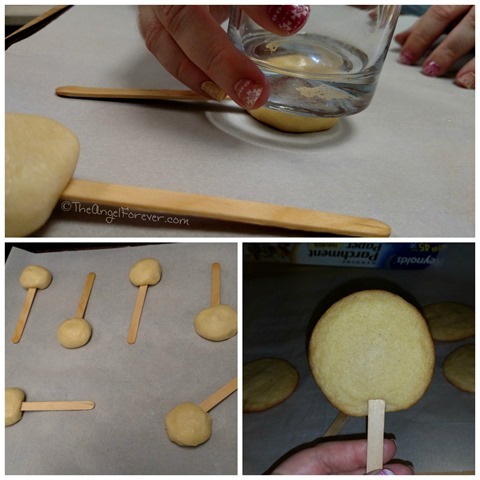 Then you place the wooden pop stick at least half way into the raw cookie dough. It is crucial to keep these spread out on your cookie sheet with parchment paper. The cookie pops baked at 375 for 8-10 minutes. They should just get a little brown on the edges and need to set. Once the cookies were baked and had cooled, it was time for the kids to decorate. 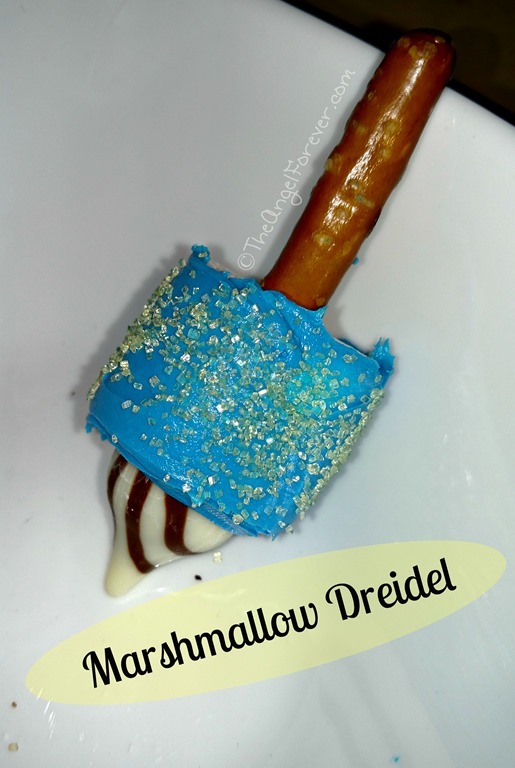 They used the cookie icing and then put sprinkles, gel, and Hanukkah gelt on them to make them festive. 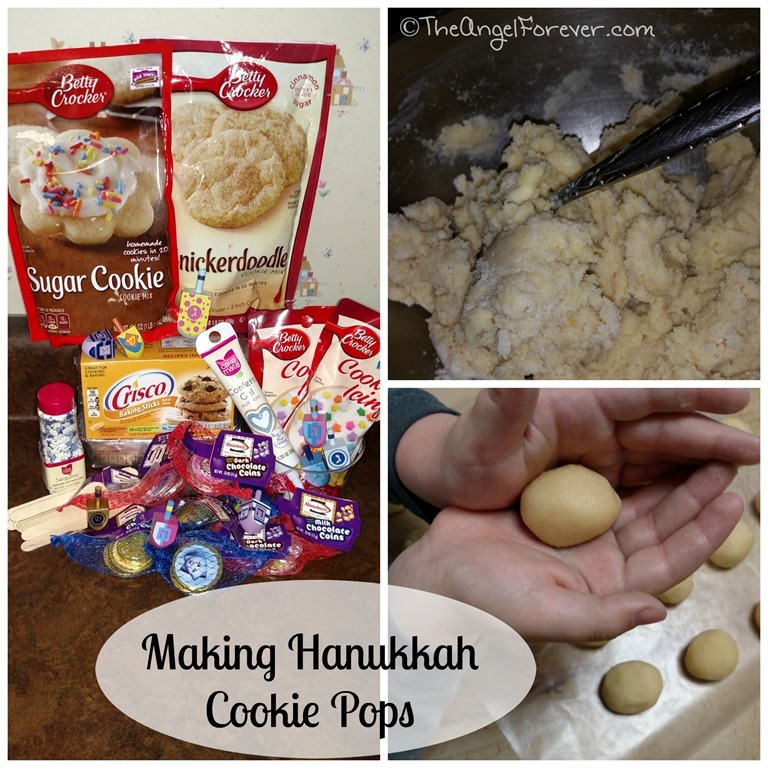 What are some of your favorite holiday recipes to make with your kids? Be sure to let me know and leave links to your posts to share in the comments below. These recipes are so cute and I love that they’re easy enough to do with kids! Thanks for sharing! Tracy Gibb´s last blog post ..2014 Less Than Perfect Parents Holiday Giveaway!